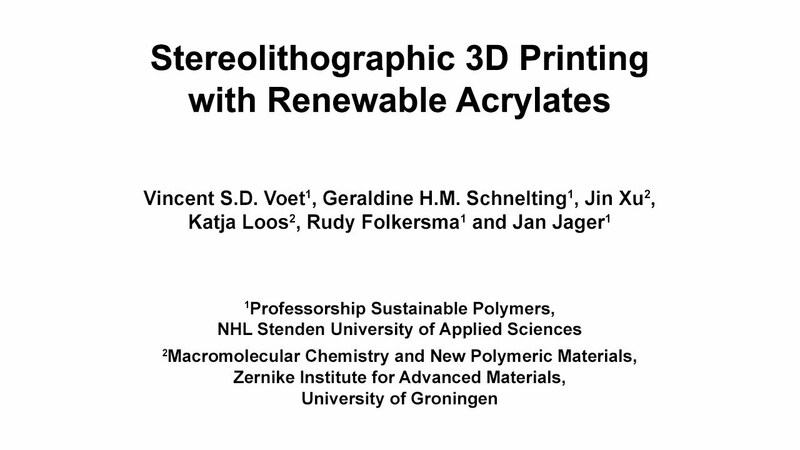 A collaborative project between the UG, NHL Stenden University of Applied Sciences and two businesses has produced a ‘green’ ink for a special type of 3D printer. An academic article about this was published at the start of the year and the experiment has also now been filmed for the Journal of Visualized Experiments (JoVE). JoVE is an online journal that aims to make it possible for people to see experiments. A regular academic article usually provides a description of how something was done, but JoVE believes that moving pictures can be useful: they make it easier for the viewer to repeat an experiment. The UG’s Department of Polymer Chemistry has already had an article visualized by JoVE. The JoVE article, which was published on 13 September 2018, is about the materials used by a form of 3D printing known as stereolithography. Stereolithographic printers don’t work with a filament, a plastic thread that melts in the print head, but instead with a liquid that hardens when it comes into contact with UV laser light. This type of 3D printer was invented in the 1980s. But whereas ‘green’ filaments made from renewable materials are widely available, until now there were no green materials for stereolithographic printers. The UG, NHL Stenden and two companies joined forces to investigate this, with the support of the Province of Friesland, among others. ‘In polymer chemistry, we are good at making and studying the material, whereas at NHL Stenden they have more experience with using plastics and the printers’, Professor of Polymer Chemistry Katja Loos explains. The trick is to get the right ratio of components. The fluid mustn’t be too thick or too thin, and the polymerization must deliver a product that is strong enough. For the new product, the components needed to be made from organic materials wherever possible. Voet: ‘For decades, this kind of fluid has been made from fossil oil. But we used materials made from plant oil. These are different compounds with a different chemical structure.’ The adaptations delivered a good result, with between 34 and 67% of the carbon atoms coming from an organic source. The aim is to increase this, says Voet, ‘but there isn’t a green alternative to all the components as yet.’ For their experiments, the researchers used materials that are commercially available, but in a follow-up study they will also synthesize molecules from plant-based waste in the lab. The JoVE film shows how the 3D printer fluid is made and how it is used in the printer. The fluid’s structure is then examined under an electron microscope. The researchers themselves carry out the steps of the process and describe what they are doing. This means that fellow researchers, and perhaps also lovers of this form of 3D printing, can also try it out. The companies involved in the project were SymbioShape from Leeuwarden and KNN Bioplastic from Groningen. Last modified: 01 October 2018 09.35 a.m.